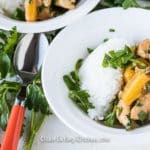 If you’re looking for an easy and flavorful Instant Pot Teriyaki Chicken recipe, then you’ll love this healthy, homemade recipe. Press the Sautébutton on your Instant Pot and let it heat up for about two minutes. Combine the chicken and garlic in the stainless steel insert of the Instant Pot and sautéfor about 3 minutes, stirring so the chicken starts to change color on all sides. Add the broth and cancel the Sauté Use a wooden spoon to scrape off any of the food stuck to the bottom of the pot (this helps prevent the Instant Pot from giving you a burn message). When the cooking time is up, let the pressure come down naturally for 10 minutes and then quick-release the remaining pressure. Remove the lid and use a slotted spoon to transfer the chicken and pineapple to a serving bowl. Press the Sautébutton and add the arrowroot starch to the liquid in the pot. Use a whisk to make sure the starch dissolves into the liquid. Let the liquid simmer for about 2 minutes so it can start to thicken. Cancel the Sautébutton and pour the chicken and pineapple back into the pot. Add the parsley and stir to combine. Serve immediately, or cover and refrigerate for up to 4 days. Allow 10 minutes to come up to pressure, 10 minutes cooking time, and 10 minutes to release the pressure naturally.